KENNEDY SPACE CENTER, Florida (CNN) -- NASA said Saturday it has postponed the launch of space shuttle Endeavour for at least 24 hours after lightning struck nearly a dozen times near the launch pad. 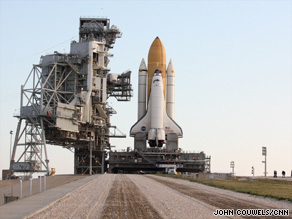 Space shuttle Endeavour, shown here last month, is rolled out to its launch pad at the Kennedy Space Center. "We need to be 100 percent confident that we have a good system across the board ... [we're going to] spend 24 more hours to just make sure that we're good," said Mike Moses, the space shuttle program integration manager. Moses, speaking to reporters in a morning briefing, said 11 strikes hit within a half-mile of the launch pad Friday night. Endeavour had been scheduled to take off at 7:39 p.m. Saturday. The next attempt is set for 7:13 p.m. Sunday. This is the third time Endeavour's launch has been delayed. It was postponed twice last month because of a liquid hydrogen leak. The mission's primary goal will be to install what amounts to a porch in space. Endeavour is carrying in its cargo bay two platforms of the Japanese Kibo Laboratory, which is already part of the space station. One platform rides up and back on the shuttle, while the other will stay permanently fixed to the Kibo laboratory for scientific experiments that require exposure to space. For many of the 16 days, the station will resemble a construction site, except that astronauts will be in space suits instead of hard hats and operating robotic arms instead of cranes. And just like at a job site, it will all be going on at the same time. CNN's John Zarrella contributed to this report.